Art can come in various forms and in a combination of unique styles too. Everyone is different and can appreciate aspects of daily life or nature that someone else may not be able to understand. It’s a self-expression of one’s thoughts and emotions encompassed on a canvas, a sheet of paper, a book or bits of scrap. You could say that art is a love. When many people think of ‘love’ within an instant most people think of romantic love or friendship love but not many think of the love of Art. For all those like minded artists, creatives and picasso’s out there you may feel that art is your love. After all, it’s a passion and you likely have belief in your work. We can understand the challenges, the unique abilities and the creative thought that goes behind each piece of art which is why we would love to see yours. In line with our #HomeIsWhereTheArtIs competition we are looking for all you future gallery artists, creatives and designers to show us your masterpieces. Whether it’s a piece of artwork you’ve created that evokes the feeling of love within you, or simply something that shows off your passion for art, we’d love to see it! To celebrate The Love of Art and all the entries we’ve received for the competition, we’ve put together a few of our favourite entries so far! 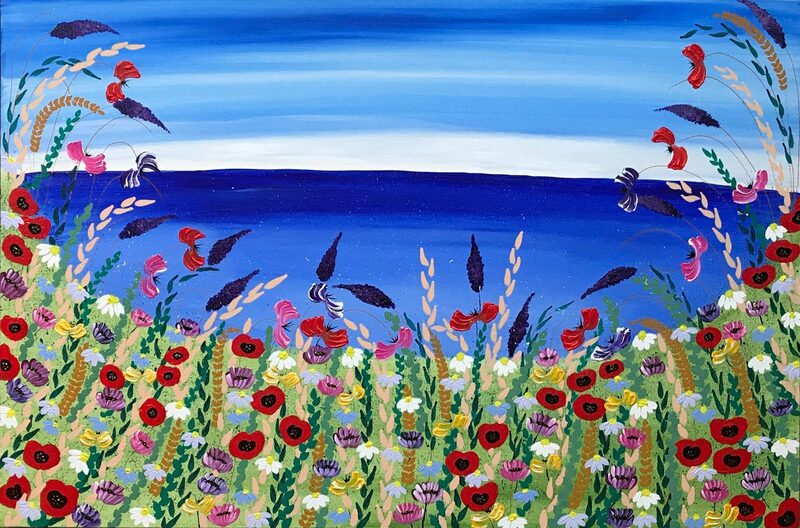 Elisa’s love for summer days in Cornwall is apparent in this vibrant painting. The colourful flowers amongst the tall grass create a positive energy and adds life to the calm, tranquil sea in the background of the scene. You can really sense the movement in the foliage and flowers, which also frame the horizon beautifully. Natalie has created this surreal Science Fiction themed portrait of a woman intertwined with planets in space. It demonstrates her love for the sci-fi genre. The captivating expression of the woman draws the viewer into the painting as she invites us into her colourful solar system. 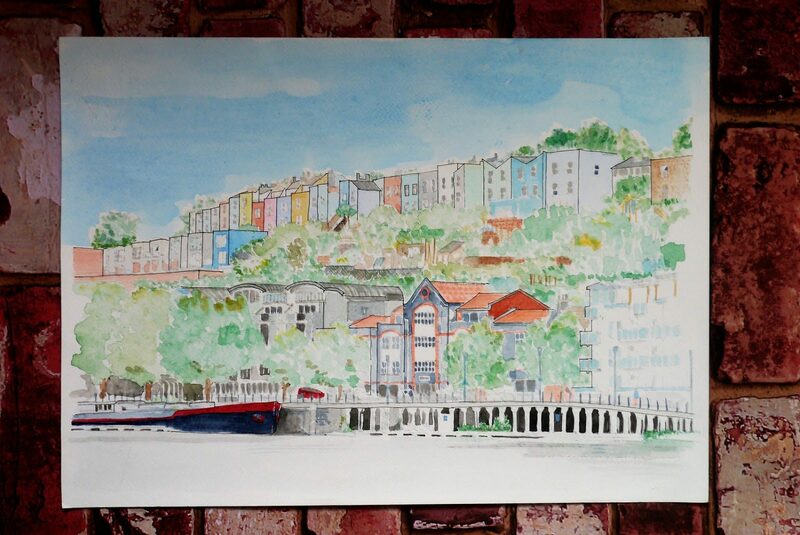 Merlinda has used bright, pastel colours within this watercolour painting of a view of houses by the waterfront in Bristol. The pastel colours combined with the light brush strokes give the artwork a happy and carefree feel. Merlinda has created this painting from a photo taken on a trip to Bristol, and it really shows her love of travelling and painting together. A gorgeous acrylic painting reminiscent of springtime flowers on the brink of bloom. 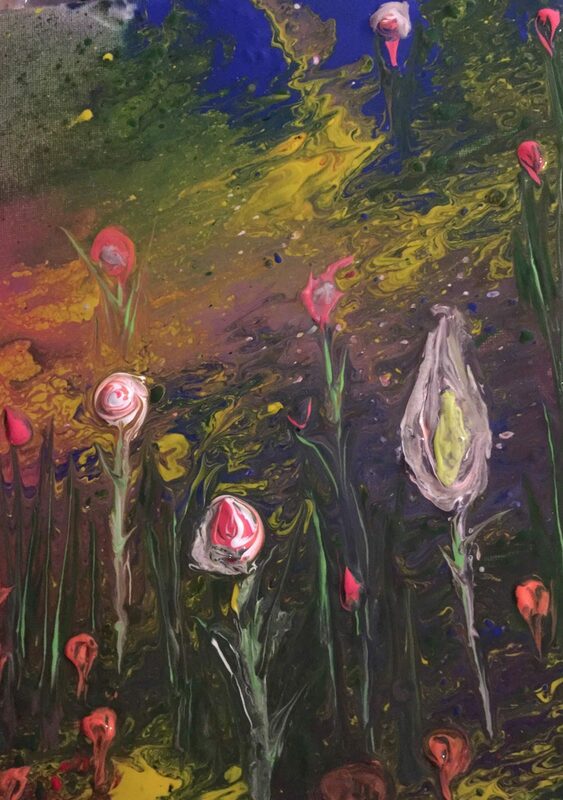 Isabelle has chosen to focus on a dozen or so flowers in the foreground, whilst obscuring the background by blending greens, purples and yellows on the canvas itself. A touch of blue is added to the top, adding just a hint of realism to the otherwise abstract painting. Isabelle’s love for the season of Spring and blooming flowers is seen here. Inspiration for art can come from many other things you love and are passionate about. This incredible piece of art by Adam Hedges was created based on his and his wife’s love for the TV show ‘Game of Thrones’. 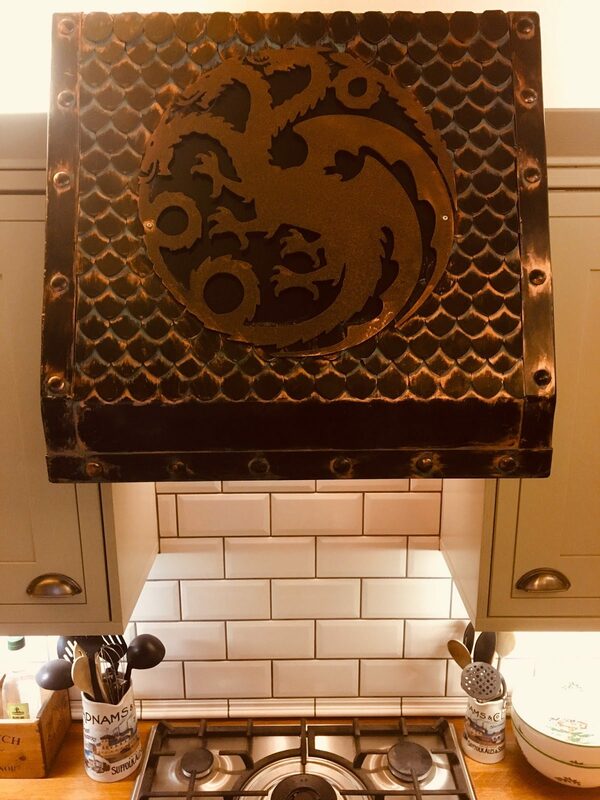 Adam has recreated The House Targaryen Sigil and attached it to a cooker hood. This truly emotive painting shows the unique bond between a mother and her baby. The mother looks down with affection and cradles her crying baby in her arms. It shows the undying love that the mother has, and the crying baby may represent the difficulties of motherhood. 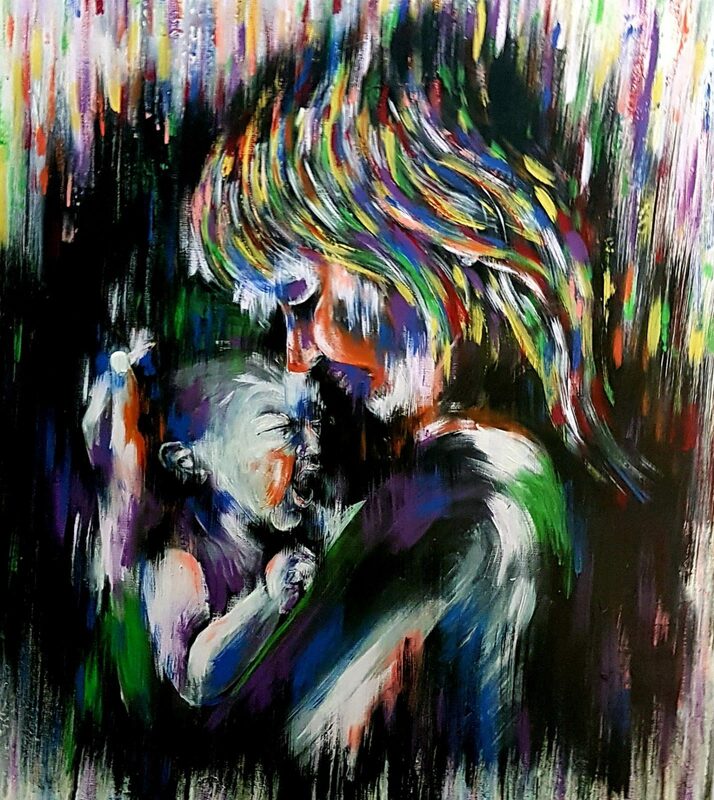 The artist uses colours to demonstrate this also, with the black expressing the struggles of motherhood, and the rainbow of colours that overlay the darkness expresses everlasting maternal love that will always be present. Don’t forget, you can submit your own brilliant arwork into our #HomeIsWhereTheArtIs competition!